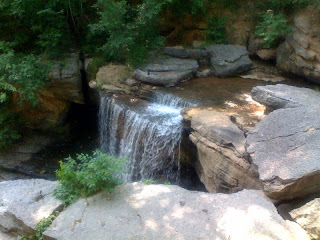 The waterfall. Such a simple thing, yet incredibly splendid and special. This one is at the end of a service road behind a hardware store off of the highway, all but hidden from view. Sometimes the best things in life turn up in the most unexpected places. I love infomercials for the same reason I love bad movies; because they’re just so easy to make fun of. And—mature person that I am—that’s what entertains me. Take this afternoon, for example. I was channel surfing while Mary was napping. I ran across several infomercials, but the one that caught my attention immediately was the starring Mr. T in an apron. He was paired up with some scrawny little white woman, and together they were explaining the benefits of being able to roast an entire chicken in eleven minutes. They were selling one of those set-it-and-forget-it-type countertop cookers, and although the volume was very low since Mary was asleep, I could have sworn I heard him say, “I pity the fool who cooks his bird in the microwave.” It struck me as a sad moment. It’s like seeing a huge pit bull wearing one of those plastic collars so he can’t lick himself. He knows that you know he’s humiliated, yet it’s something he’s got to do. After beating the crap out of Sylvester Stallone as Clubber Lang in Rocky III, it must be unbelievably emasculating to be a sidekick to some infomercial bimbo and say lines like, “I can’t believe this cake was cooked on the countertop. It’s so moist!” It’s Mr. T, for crying out loud. At least write the lines like we would expect him to deliver them. “Woman, dis cake is moist as hell! You bes’ git me some mo’ or I’ll tear dis place up!” But, no. He’s lifting the lid off of this cooker to reveal a perfectly-cooked steak. As he cuts into it and turns it to show its inside to the camera, he says, “See that wisp of pink? Now that’s a good steak!” I can’t take it anymore. I’m changing the channel. And if I run across Hulk Hogan making smoothies in a Magic Bullet™, I’m calling it a day.